A. Lagutschenkov, R.K. Sinha, P. Maitre, O. Dopfer. 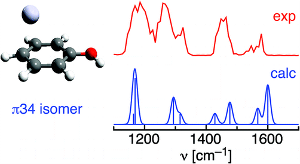 The structure and infrared (IR) spectrum of the Ag+−phenol cationic complex are characterized in the gas phase by photodissociation spectroscopy and quantum chemical calculations in order to determine the preferred metal ion binding site. The IR multiple photon dissociation (IRMPD) spectrum has been obtained in the 1100−1700 cm−1 fingerprint range by coupling the IR free electron laser at the Centre Laser Infrarouge d’Orsay (CLIO) with a Fourier transform ion cyclotron resonance (FT-ICR) mass spectrometer equipped with an electrospray ionization source. The spectroscopic efforts are complemented by quantum chemical calculations at the MP2 and B3LYP levels using the aug-cc-pVTZ basis set. Analysis of the IRMPD spectrum is consistent with a π complex, in which the Ag+ ion binds to the aromatic ring in an η1 (B3LYP) or η2 (MP2) fashion to carbon atoms in the para position of the OH group. Ag+ bonding to the hydroxyl group in the form of a σ complex is calculated to be less favorable. Comparison of the structural and vibrational properties of phenol, Ag+−phenol, and phenol+ suggests partial charge transfer upon formation of the π complex.